CML is a myeloproliferative disorder derived from the neoplastic transformation of hematopoietic stem cell (HSC) and characterized by the expansion of the myeloid lineage. The characteristic mutation at the basis of CML is the reciprocal translocation between chromosome 9 and chromosome 22, t(9;22)(q34;q11), which originates Philadelphia chromosome coding for the chimeric protein BCR-ABL. BCR-ABL acts through a complex network of substrates to promote proliferation and survival of leukemic cells causing the rapid development of myeloproliferative disease. The incidence of CML is 1-2 cases per 100,000 people per year and it represents 15% of leukemia cases of adult population. This disease has a low incidence in people under 40 years, but frequency increases rapidly with age, with a mean age at diagnosis of 45 -55 years old; 30% of patients has over 60 years of age at diagnosis. Considering CML as a disease in which there is a single gene driver, previous years researchers focused their work in the search for new tyrosine kinase inhibitors, which could be active against any mutant forms of BCR-ABL. Obviously the development of a therapy able to eliminate the primary cause of leukemia is necessary if we want to obtain the “complete eradication” of leukemic cells, but other useful approaches can be evaluated. For example, drugs directed against biological signals which confers an advantage to leukemia cells (like the ability to make them more aggressive), or drugs capable of increase the activity of the endogenous inhibitors of tyrosine/kinase activity, may be equally effective in the treatment of the disease. Often the pathology presents alterations of some signal pathways which are not due to genomic alterations, but to an aberrant activity of some regulatory elements or to them extrusion from their specific cellular compartments. This is what occurs to the oncogene PTEN in CML. These kind of functional alterations are called “non genomic loss of function”. The PTEN (Phosphatase and Tensin Homolog) gene is located on chromosome 10, it was identified for the first time in the 90s, and it encodes a protein with the same name. PTEN is a dephosphorylase and its substrate is the phosphatidylinositol-3,4,5-triphosphate (PIP3), which act as second messengers in the PI3K-Akt signaling pathway, which is involved in proliferation, cell growth and survival. The full-length PTEN protein comprises 403 amino acid residues and is subdivided into four main regions: an N-terminal PIP2 binding module, a phosphatase domain (PD), a C2 domain, a C-terminal tail containing the PEST (proline, glutamic acid, serine, threonine), and, in the end, a defined zone (PDZ). Different transcriptional regulatory mechanisms control PTEN expression. Several transcription factors bind directly to the PTEN promoter and regulate PTEN expression. Mitogen activated protein kinase kinase-4 (MKK4) inhibits PTEN transcription by activating NF-kB, a transcriptional repressor that binds to the PTEN promoter. Similarly, JUN suppress the transcription of PTEN by binding to a variant activator 1 (AP-1) site, called PF1, in its promoter; high levels of JUN in human tumor cell lines are associated with low levels of transcripts of PTEN. The upregulation of PTEN transcription can be due to the activation of Peroxisome Proliferator-activated Receport γ (PPAR- γ), which recognizes two PPAR response elements (PPREs) in the PTEN promoter and mediates its transcription in both cancer and normal cells. Both positive and negative regulation is carried out by the Transforming Growth Factor (TGFβ). In pancreatic cancer cells, TGF β positively regulates PTEN transcription in a SMAD-dependent manner and negatively controls it in a SMAD-independent way. However, TGFβ has inhibitory function in mesangial cell models of diabetic nephropathy. The binding of the growth factor (GF) to its membrane receptors activates RAS, which, through the activation of hSPRY2, increases PTEN mRNA levels. In the end, p53 regulates PTEN both positively at the transcriptional level and negatively at the protein-stability level: a functional p53 response element (RE) has been found in the PTEN promoter, and p53 induction leads to elevated PTEN mRNA and protein levels. PTEN might autoregulate its own expression through stabilization of p53 protein independently of its phosphatase activity. Some PTEN post-transcriptional regulation mechanisms are phosphorylation, acetylation and oxidation. PTEN is phosphorylated by Casein Kinase 2 (CK2) on serine and threonine residues in its C-terminal portion, and the phosphorylation of these domains is involved in PTEN stability. They have identified several phosphorylation sites, such as Ser-370, Ser-380, Thr-382, Thr-383 and Ser-385 residues, which are essential for proteasome-mediated degradation. Moreover, evidences also show that the RhoA-associated kinase (ROCK) is involved in the activation of PTEN through its phosphorylation at amino acid residues in the C2 domain. Acetylation is another mechanism which appears to negatively regulate PTEN activity, it occurs with the activation of histone acetyltransferase-p300/CBP-associated (PCAF). PTEN activity can also be inhibited by reactive oxygen species (ROS), which mediate the oxidation of a cysteine in the catalytic domain of PTEN. PTEN is a tumor suppressor and it acts opposing phosphatidylinositol 3 kinase (PI3K), PTEN catalyze dephosphorylation of phosphatidylinositol-3,4,5-triphosphate (PIP3) to phosphatidylinositol-4,5-bisphosphate (PIP2). In response to extracellular stimuli (like insulin, growth factors, chemokines) the catalytic subunit of PI3K (P110) is recruited by membrane receptors, like tyrosine/kinase receptors (RTKs) or G protein-coupled receptors (GPCRs), and then, through its regulatory subunit (P85 and P101), PI3K phosphorylates PIP2 to generate PIP3. PIP3 binds with high affinity to the Pleckstrin Homology (PH) domain of different cytosolic proteins, the most important of which is the serine-threonine kinase Akt. 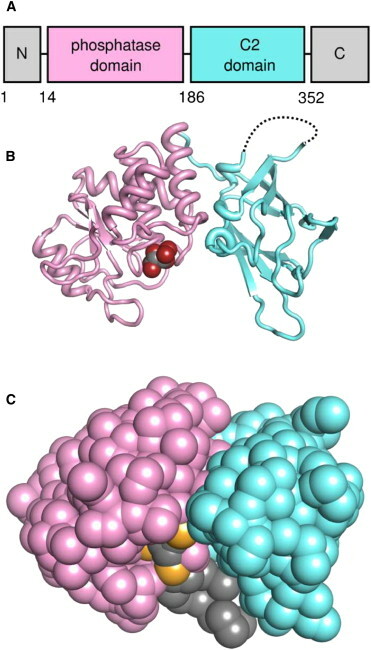 The binding of Akt to PIP3 generates a conformational change of the kinase that results in the phosphorylation of the Thr-308 residue, by phosphoinositide dependent protein kinase 1 (PDK1), and the Ser-473 residue, by the PDK2 kinase. These events activate Akt. Akt exerts its function through its target FOXO and TSC2 (also known as tuberin). Through FOXO (a transcription factor) phosphorylation, Akt increases cells proliferation and survival. By inhibiting TSC2 by phosphorylation, Akt actives mTOR, whose function stimulates cells growth, proliferation, motility and survival. Akt mediated phosphorylation also inhibits the activity of certain proteins such as BAD, a protein with pro-apoptotic functions, and glycogen synthase kinase 3 (GSK3), assigned to the modulation of glucose metabolism. Akt phosphorilation increases the activity of substrates such as MDM2, which promotes the degradation of p53, and the transcription factor NF- kB. So PTEN phosphatase acts as a tumor suppressor by adjusting the concentration of intracellular PIP3. Also PTEN localization plays an important role, because it can influence its function allowing or not PTEN membrane recruitment. The C2 domain and the PIP2 binding domain (PBD) are important for the cytosolic function of PTEN. Localization and activity of PTEN are also regulated by mechanisms of phosphorylation. The phosphorylation of PTEN on the C-terminal domain by certain kinases, first of all the CK2, is associated with a decrease in PTEN activity, which coincides with a lower recruitment to the membrane. PTEN inhibition is due to a conformational change of the C-terminal domain, which interacts with the C2 domain; the protein assumes a closed conformation so that is no longer able to function. In addition to cytoplasmatic activities, PTEN has also a nuclear function, confirming its importance as a tumor suppressor and explaining its different localizations. The role it plays in the nuclear compartment is still unclear, but probably the protein is implicated in the maintenance of genomic integrity and in the inhibition of cell proliferation. PTEN localization is regulated by mono- and de-ubiquitination mechanisms. An explanation of mechanisms that modulates its compartmentalization comes from the study of Cowden syndrome, in which has been found a mutation of a lysine which generates a mutant of PTEN phosphatase which retains its functions but loses the ability to migrate into the nucleus. Mechanisms of mono-ubiquitination on this and other lysines are mediated by E3 ligase neural precursor cell expressed, developmentally downregulated 4-1 (NEDD4-1). Cytoplasmic PTEN can be mono-ubiquitinated, but can also undergo many ubiquitination events mediated by NEDD4-1, this leads to its degradation by the proteasomic way. PTEN is a tumor suppressor protein located between the nuclear and cytoplasmic compartment, where it mediates several functions concerning control of cell proliferation and survival. In normal cells PTEN is distributed in both compartments, whereas in some neoplastic forms it can be expressed exclusively in the cytoplasmic compartment. Studies about the role and localization of this protein in CML showed that BCR-ABL mediates the exclusion of PTEN from the nucleus. The confirmation that PTEN nuclear exclusion is mediated by Abelson kinase comes from the treatment with Imatinib. In fact, when this drug is administered, BCR-ABL fusion protein is inactivated and PTEN returns to its physiological localization. Several studies have shown that the nucleus to cytoplasm translocation is regulated by a mechanism of mono-ubiquitination. In particular, PTEN mono-ubiquitinated form presents a predominant nuclear expression, while the de-ubiquitination process leads to PTEN exclusive cytoplasmic localization. Since the de-ubiquitination of PTEN, and so its exclusion from the nucleus, is regulated by HAUSP, a de-ubiquitinase, it is hypothesized that BCR-ABL can interfere in this process by interacting with this protein and in this way it modifies PTEN localization. Therefore HAUSP could act as a de-ubiquitinase and regulate the levels of ubiquitination of PTEN, and consequently its localization, in a BCR-ABL dependent manner. HAUSP can be activated by BCR-ABL through tyrosine phosphorylation and then it can mediate PTEN de-ubiquitination and displacement from the nuclear compartment to the cytoplasm. The understanding of the link between BCR-ABL and HAUSP allowed us to identify the phosphorylation mechanism of HAUSP mediated by BCR-ABL as the pathogenetic process responsible of the repositioning of PTEN. PTEN levels are reduced especially in myeloid lineage and in these cells the localization of PTEN is only limited to the cytoplasmic compartment. However it has been seen that the localization of PTEN in CML progenitor stem cells remains cytoplasmic and the mechanism by which the stem cell compartment mediates PTEN localization can have a therapeutic relevance. It is known that PML is highly expressed in the most immature myeloid compartment, while its expression decreases during the maturation process, and we also know that PML-HAUSP interaction leads to a loss of function of the de-ubiquitinase, so PML indirectly regulates PTEN localization. Results previously shown demonstrate that PML may counteract the effects of BCR-ABL in HSC, instead its reduction during differentiation promotes PTEN migration. PML plays a key role in the regulation of PTEN in HSC of CML and we know there is a drug, nitrogen trioxide, which already target this protein. These data are really interesting from the therapeutic point of view, since arsenic trioxide is used for the treatment of myelo-proliferative diseases such as acute promyelocytic leukemia. So it can be used also for the treatment of CML. Analysis performed on cells of patients with CML revealed that cells treated with the combination of Imatinib and arsenic trioxide showed a significant increase in the percentage of dead cells compared with cells treated with Imatinib only, which is the standard therapy, or with arsenic trioxide only. This effect is due to the fact that arsenic trioxide promotes the entry of leukemic stem cells into the cell cycle and it generates an increased sensitivity of the cells to the treatment with Imatinib. In conclusion these results indicate PTEN delocalization as a possible new pathogenic mechanism of CML and they identify BCR-ABL mediated HAUSP activation as the regulatory element of the mechanism. Indeed data evidence PML activity on PTEN in leukemia stem cells and they indicates a possible new therapeutic target using a treatment with arsenic trioxide which can specifically hit leukemic stem cells resistant to the already used tyrosine-kinase inhibitors.